I think many people might have gone into Crimson Peak thinking it was some sort of horror film. Instead, we got something closer to Gothic romance with ghosts in it, a bit of a supernatural-tinged Jane Eyre. It's by no means bad, and it has mostly good performances. It might a bit too grand for my tastes and a bit heavy-handed with the symbolism of things, but on the whole, I could live with it. Edith Cushing (Mia Wasikowska aka The Great Love of My Life) lives in Baltimore with her long-widowed father, Carter (Jim Beaver). Shortly after her mother's death when she was young, Edith saw her mother's specter, warning her to 'beware of Crimson Peak' (which I think is as vague a warning as the undead have given any fair maiden). Edith is a frustrated authoress, a bit bookish and trying desperately to break into publishing like her heroine, Mary Shelley. Her only champion apart from her father is her childhood friend, Dr. Alan McMichael (Charlie Hunnam), whose own hero is another eye-doctor, Arthur Conan Doyle. Enter into Baltimore society Sir Thomas Sharpe (Tom Hiddleston), an English baronet come to Baltimore for finances from Carter to fund Sir Thomas' invention to save his fortune. Carter points out to Sir Thomas that he's gone to several places for finances, and has been turned down. Baltimore will be no different. However, Edith is drawn to the mysterious baronet, and he to her. Only Sir Thomas' balmy sister, Lady Lucille (Jessica Chastain) appears to be displeased by the potential for romance. And romance there is, though Sir Thomas is not above getting paid off by Carter to break Edith's heart. Fortunately for the thwarted lovers, Carter dies at his club just as Sir Thomas defies Carter to return for Edith. It isn't long before Edith becomes Lady Sharpe. It isn't long also before things at the decrepit Sharpe home, Allerdale Hall, show themselves to be bonkers. Edith feels trapped in the isolation of Allerdale Hall, and Thomas & Lucille are very clearly hiding a lot of somethings. Dr. McMichael is also wary, discovering that Carter had put an investigator on the Sharpes and investigating Carter's death. Despite what appears to be genuine romantic, even sexual, interest by Thomas to the virginal Edith, he still has not deflowered his bride. Lucille, for her part, appears to permanently hover without actual levitation. Edith is helping fund Thomas' machine that will bring out red clay from the earth around Allerdale Hall, and McMichael makes some shocking discoveries about the truth involving Carter and the Sharpes. On a rare visit to town, Sir Thomas and Lady Sharpe are snowed in and forced to stay the night, where at last, they indulge in the pleasures of the flesh. Lucille appears enraged at the mere thought that someone was intimate with her brother...wonder why. Edith, who is slowly getting weaker, sees her dead mother again, along with other ghosts, and now Edith makes a shocking discovery of her own. 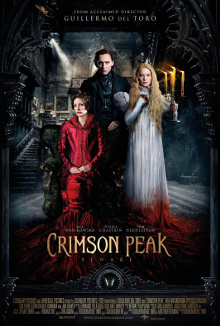 Allerdale Hall's nickname among the population is...CRIMSON PEAK! McMichael goes to Crimson Peak to reveal what Edith has already put together...Sir Thomas has been married at least three times, with all three Lady Sharpes dying in ugly circumstances. All three Lady Sharpes were also wealthy daughters who had no other relations and thus, would not be missed. In what could have been the most shocking discovery of all, Lucille the older of the two has been carrying on a long-term affair with her brother Thomas, going so far as to murdering her mother for the crime (and spending time in the Victorian-era version of a psycho ward too). Lucille tries to murder McMichael and tries to get Thomas to commit his first murder, but Thomas appears to have a change of heart and merely injuries the good doctor. Lucille murders Thomas, had earlier tried to kill Edith, and finally meets her end at Edith's hand (with a little help from Thomas' ghost). In the end, the widow Lady Sharpe has written her book, called Crimson Peak. I figure that Crimson Peak was director/co-writer Guillermo Del Toro's homage to Gothic horror films. Just the name "Cushing" for our heroine suggests Del Toro looked to Hammer Films for inspiration. The Gothic settings, the deliberately ornate costumes, the dilapidated, isolated mansion (complete with a hole in the roof that allowed for gentle snow to cascade down), the weird siblings...it all adds up to a film that clearly wants people to pay attention to surroundings and be lost in the decaying splendor of it all. Even the performances are I would argue deliberately stagey. I point out that we a most fascinating circle of acting here. We have an Australian (Wasikowska) playing an American, an American (Chastain) playing an Englishwoman, and an Englishman (Hunnam) playing an American. Only Loki gets to play his native nationality. Perhaps because the acting is, I hope, deliberately stagey and grandiose I will forgive the oddball nature and posing by Hiddleston and Chastain. They were MEANT to be really, really weird...so I figure when you play incestuous siblings you can be a bit mannered. Wasikowska, who I think is just one of our great young actresses today (dare I call her this generation's Meryl Streep?) played the part of the somewhat frightened Edith beautifully. Oh yes...she played Jane Eyre in one of my favorite versions of the Bronte novel, so she's pretty adept at channeling harried maidens. Hunnam really had little to do, but he was effective as the platonic friend who wants to be more than the platonic friend. I personally found the story a bit clichéd, and moreover what was supposed to be shocking was rather predictable. It's obvious that Thomas and Lucille were excessively close (put that up to the style of acting they performed) and sometimes things were just a bit too much to make things serious. When Lucille stabs McMichael, the fireplace bursts into flames (which is way over the top). The talk Lucille and Edith have about butterflies and moths is again extremely overt, with the dark-clothed Lucille hovering over the bright-colored Edith like the dark moths over the bright butterflies, with the former devouring the latter. When we discover Lucille and Thomas not quite in an intimate moment, the audience really should be expecting that (and when Lucille tells Edith that they ARE brother and sister, it isn't shocking, but actually boring). Besides, the script (co-authored with Matthew Robbins) is a bit unfair. How was Edith to know Allerdale Hall was Crimson Peak? It isn't like she learned this until late into the film. WE knew because...that's the name of the movie, but the characters? 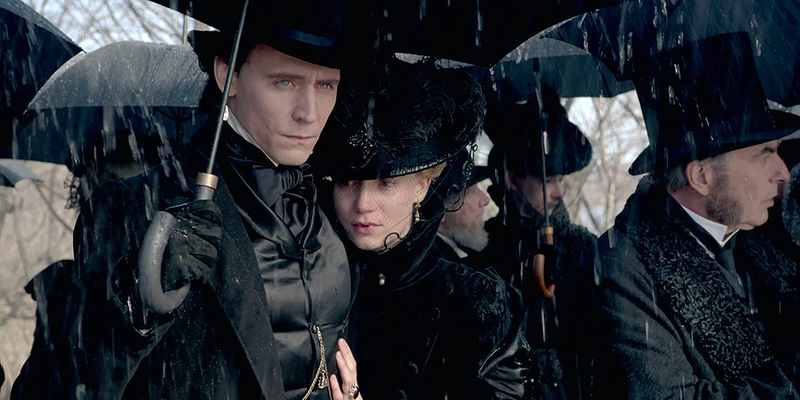 Crimson Peak knows what it is: a variation of Jane Eyre with ghosts rather than with crazy wives locked in the attic. Less horror film than off-kilter Gothic romance, the film is OK, but don't go in thinking it's a horror film. If you accept it for what it is (even in its obvious nature), Crimson Peak is a way to pass a couple of hours. Then again, I'll gladly spend a few hours with My Mia.